I have narrow wide oval 32t ring for 104bcd I have to get direct mount chainring! If you've already got a 4 bolt chain ring, you could use a spacer instead of the second ring. 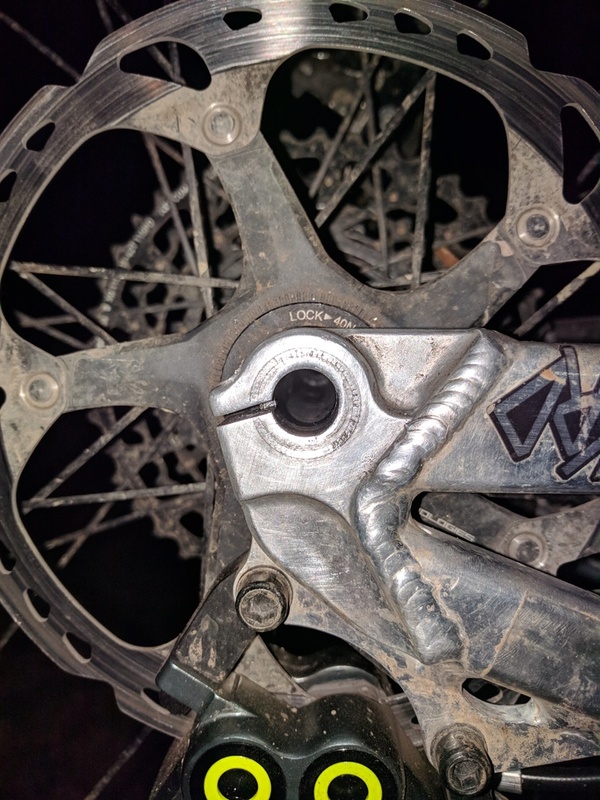 I ran a 104 on a Zee crank set to get me riding. Direct mount gives a better chainline so less wear and no backpedal issues. The short chainstays make backpedaling a bit$$ your chainline is too off. Last edited by jsalas2; 12-17-2018 at 08:43 AM. Last edited by gfelix; 01-05-2019 at 12:30 PM. I recently was pulling my rear wheel on my Riot to replace hub bearings. Unfortunately I was a bit distracted, and instead of loosening the wheel I ended up tightening it (pretty dumb, I know). The axle creaked, and then moved about 1/8 to 1/4 a turn. I then realized what I was doing, and then actually loosened the axle. Is it possible I could have damaged something? 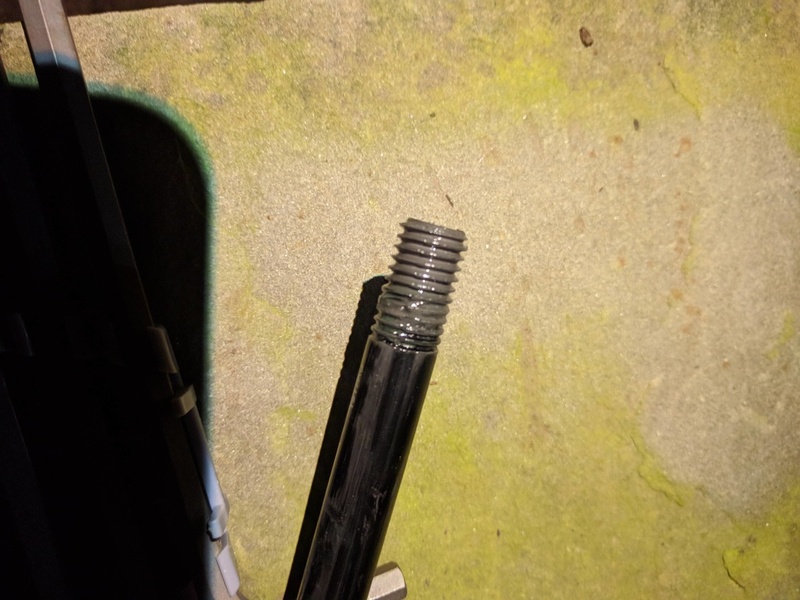 I pulled the axle out, the only real difference I noticed was some slightly deeper than normal score marks from the axle head (Salsa deadbolt UL - for some reason it has spikes on the bottom). My normal torque is solidly tight, using one hand and a 6in hex key. I would estimate between 10-12nm. This unexpected tightening was still with one hand and a 6in hex key. I would be surprised if it was over 14-16nm. The top eyelet of my Topaz has also begun sliding horizontally for the second time. If I grab the shock and push or pull, the top of the shock will move horizontally slightly. DVO sent out new bushings and hardware which solved the play initially, however after one ride the movement is back. Has anyone experienced anything similar previously? I'm starting to wonder if the shock eyelet is narrower than normal, or if something is wrong with the frame mount. Try treading the axle with out the hub, grease it good and see if there is any area that sticks. Sounds good, I'll pull the wheel (this time correctly) and try threading the axle. Sorry if I'm missing something, but what do you quite mean by "any area that sticks"? Additionally, would you recommend greasing just the axle threads, or the head and shaft too? Just grease the threads. If the axle goes in easy its probably ok. If you feel any hesitation it may have some damaged threads. I finally got around to checking the rear axle - the axle came out and went in really easy, the only "damage" I could find was some additional marking on the frame under the axle head (thanks spiked axle head). While everything looks ok to me, I definitely would appreciate a second option. I got some photos detailing the inside/outside of each dropout. Also, how much are you guys tightening your axles and pinch bolts? Thanks for the help and advice Cerberus75. 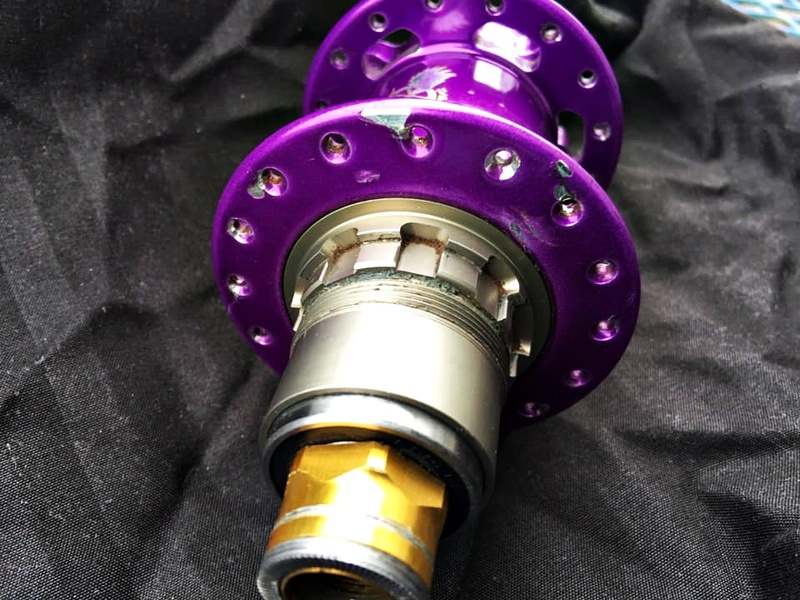 Does anybody have any thoughts or impressions of using offset bushings on the rear shock? I love this bike but it suffers from the “on it” not “in it” feeling and I’d like to do a little bit to rectify that. Phoenix864, how have the Maguras performed in the Riot? Are you able to compare them to the ubiquitous Shimano brakes? That is what I am looking to upgrade from on my Canfield. Sounds good, I'll definitely stick to nicely hand tight from now on. Thanks for the prompt help and reassurance. The Maguras have been excellent. I previously have run both a set of Shimano XTR M785s and SRAM Guide Rs. The MT7s obviously offer far more power than both (I think it would be difficult to find a more powerful brake than the MT7s), while also offering great modulation and lever feel. Lever feel is a bit softer than Shimano in the early part of the stroke (allowing for better brake feathering), before firming up quickly through the middle and end stroke for max power. Using mineral oil is a big plus for me, though I can't comment on how easy it is to bleed them (haven't needed it yet). The HC lever blades are shaped nicely and feel very solid, and the reach and contact point adjustments work well. 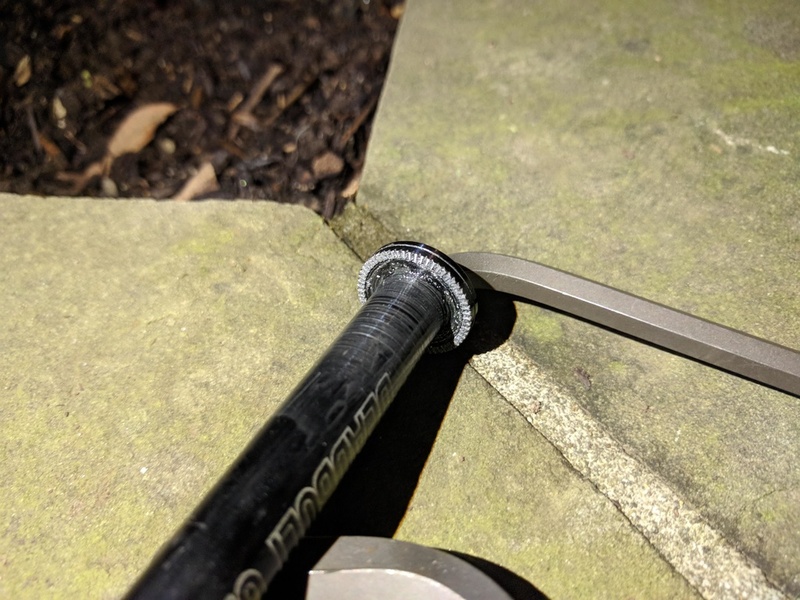 I've only come across two concerns/issues so far - First is that the lever clamp screws directly into the composite lever body. This makes it really easy to strip the lever body threads, and since the lever body is one piece a replacement isn't cheap. Second is that the calipers are very difficult to align, even with thinner IceTech rotors. Even after my best effort I was still getting some slight rub. 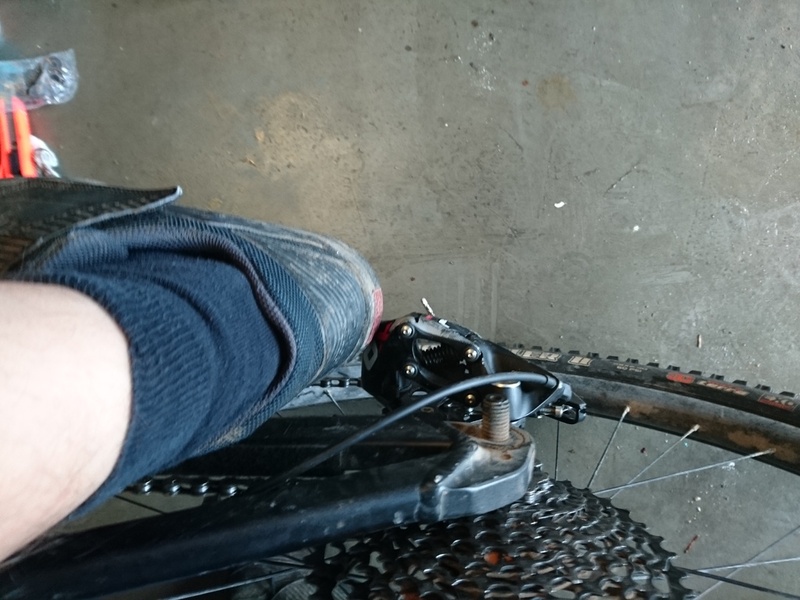 However, I couldn't notice it on the bike so it wasn't too big of a deal (the rub might have even gone away after wearing the brake pads a bit, though I haven't checked recently). That said, I would definitely buy a set of MT7/5s again over anything out of SRAM/Shimano. Their power is right in line if not greater than both Saints and Codes, while offering (in my opinion) a superior lever feel and using mineral oil. Last edited by Phoenix864; 01-10-2019 at 09:01 AM. Hi to all I changed my bushings in the frame on rear shock because the rear one has little play side to side now after 2 months again the rear ones have play side to side again! maybe the frame has damage? or just the bushings its too soft? and when pump the bike feel gap in the rear shock when uninstalled the shock the frame arms has no gap or anything suspicious! Is there someone with this problem with this frame? Interesting, I have a very similar problem. I can push the top of my topaz side to side slightly with it mounted in the frame. I've tried new hardware and bushings, but the movement persists. I've spoken to DVO about it, and someone there actually has the exact same problem on a riot with a topaz. They said that they would try some slightly wider hardware and get back to me. I'll update when I hear back. I hope there isn't some sort of widespread problem with the riot's shock mounts. fail for sure for this nice bike and dvo which I love it so much and works great for what I do here in Greece!! please send me pm when you have news because I dont want to damage my frame and the shock!! Im going into the 3rd season with the same bushings on my shock. Its a different shock (Avy). And both of you have issues with DVO bushings leads me to believe that they are too soft. Unless both of you have wider spacing than spec. When the bushings are new are they a tight fit? Even after installing brand new bushings and hardware I was still able to slightly slide the shock horizontally. When I measured the frame and shock with a set of calipers the numbers were relatively close to their listed widths, but obviously something is not quite within spec. 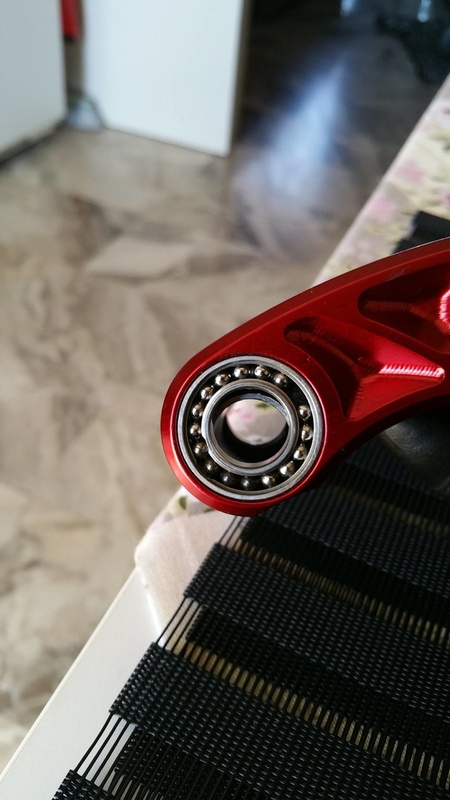 your frame has the bolu bearings or enduro maxx? Sorry about the issue Phillip. That problems seems to be specific to Canfield frames. We have a Canfield frame in our demo fleet and have the same problem. We’ve tried different brands of mounting hardware and after a few months, we get the same side to side play. We think it may have something to do with excessive flex in that rear triangle. Let us know if we can help in any other way and thank you for riding DVO! I will send and the bros anyway for the record! My Topaz/DVO bushing were a loose this also, and cause cracking/popping/creaking in the rear end when the frame was being torqued and loaded. 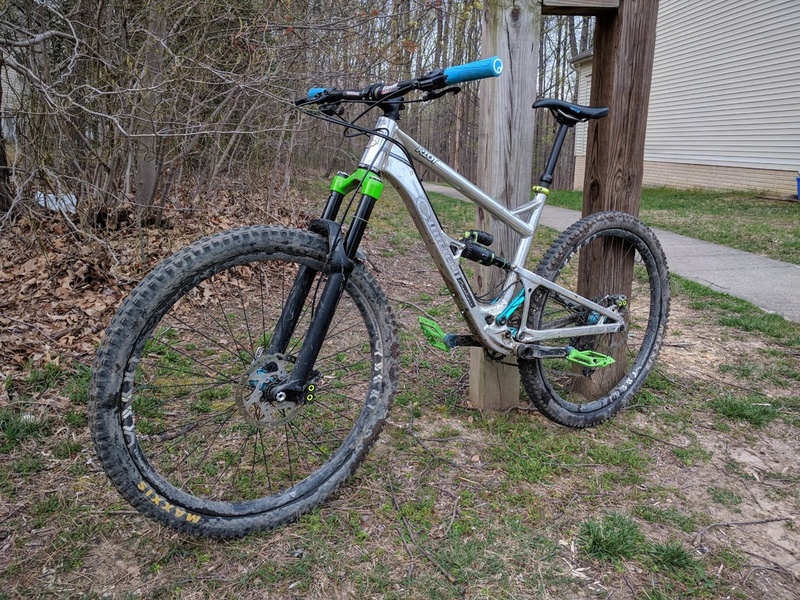 My issues went away and have not come back since swapping to Cane Creek. Push 11-6 does not seem to have this issue. I had DVO and RS and CC rear shocks when I had my Riot. The DVO hardware was always a little narrower than the othes and would do this also. I loved how the Topaz rode but it wasn't all ice cream and cotton candy goodness. Anyone think the PUSH Low Friction Mounting Kit could fix the DVO Topaz/Riot problem? I don't understand why the DVO end caps are soft plastic at that location. Just got a response back from DVO. They'll be sending out some 22.2mm (vs the old 22mm) front hardware, hopefully it will solve the issue. I have been noticing some periodic popping and creaking under heavy load. 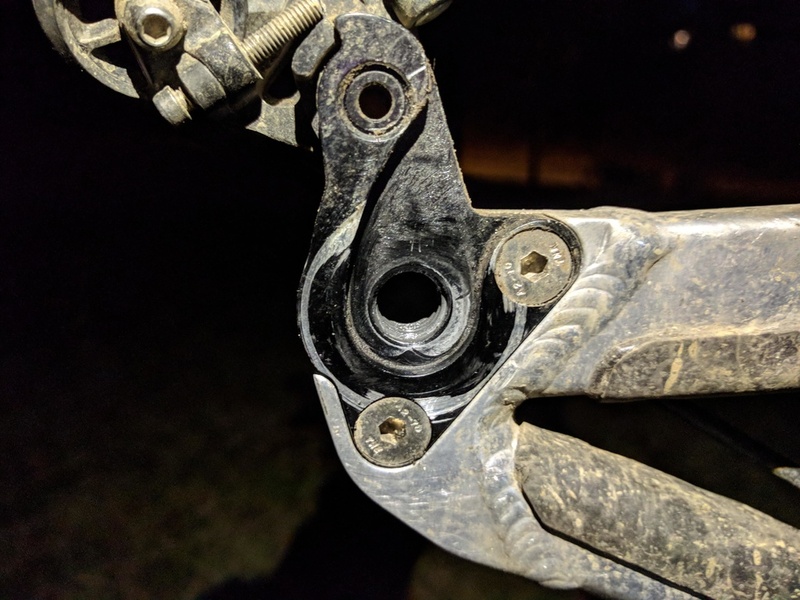 I originally though that it was coming from the linkage, but after cleaning it up the noise was still there (unfortunately I didn't check which kind of bearings I had, sorry). It seems like it could be coming from this shock play. I'll definitely report back once I get the hardware fitted. Darksoul, did you speak to DVO USA, or your local DVO importer? I can definitely say that when I spoke to DVO USA they did not share the same option as what the message you got stated. Other shocks are being run on Riots for months without developing bushing play, so it shouldn't be related to the frame design. Never mind, "Our kits fit Model Years 2000-2016 FOX Air Shocks and FOX Coil Shocks only". I have the cards from the box I installed! In the site the 36x8 bushings doesnt exist ok I thing that 0.8mm is the problem in my situation and I have to find spacers for sure! maybe bushings from other company could be installed without this problem? (Sorry, saw your post first in the Topaz thread but this info is probably a bit more relevant here). Maybe I can find the bushings from Fox here! Its compatible 100% because Im no expert! - Shorter links = better? - Heat shrink on cables from factory? Better wait for the real deal, IMO. Seems like function was compromised for form here. 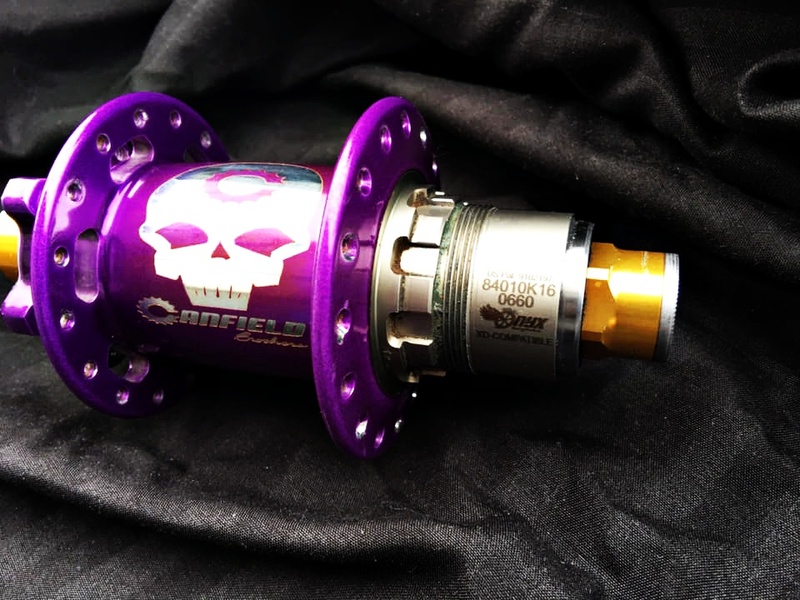 Pros- Canfield gets money from licensing out their suspention, which is one of the most efficient active suspension designs. Cons- doesn't have the whole package. Short chainstays and the 9er is less travel than the current Riot. I hope this company does well so Canfield gets paid. And Canfield still makes bikes. 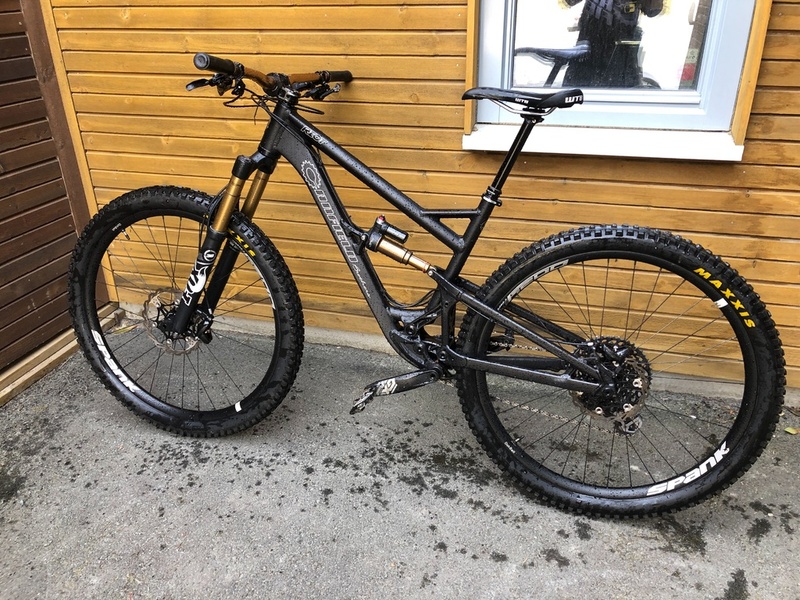 Definitely an interesting bike (visually looks like a Canyon Spectral 29er), but it doesn't seem like much of a Riot replacement. Besides the points that Ninjichor stated, it also lacks Canfield's signature short chainstays, the Riot's steep STA, and Canfield's anodized links. 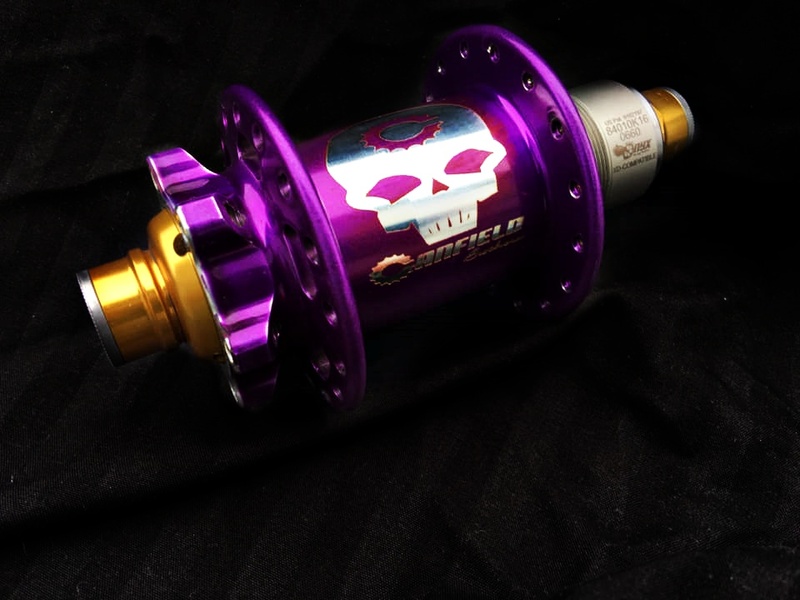 That said, hopefully licensing out their suspension design will help keep Canfield afloat. Gets a week's worth of hype for CBF hopefully. That's good! I bet it's a fun bike to ride. Total 21.56mm, .64mm too narrow. Total 21.42mm, .58mm too narrow. The shock makes a creak/pop each time it slides. I have a feeling the hardware is the source of the creaking I've been hunting for a few months. I took this info back to DVO and they kind of brushed it off, saying everything was normal. This rather surprised and disappointed me, speaking that they previously treated the movement as a problem. As far as I can tell, there seems to be far too much space in the hardware. At this point it doesn't seem like DVO wants to do anything else, and I don't know exactly where to go from here. Speaking that the Topaz is the OEM shock on the Riot, has someone else had an issue similar to this and managed to fix it without swapping to a totally different shock? Might try offsetbushings.com. 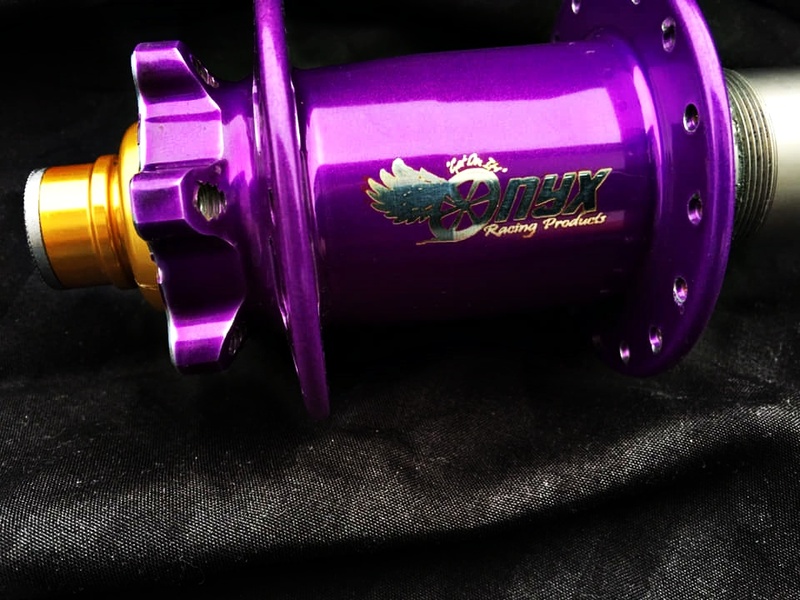 They make both standard and offset hardware, and they custom make each one for your frame/shock. Typically you just give them the frame and shock info but if you think something is out of spec on your I’m sure they’d work off your measurements. According to CB page, Riot has 22 mm upper mount. I have some issues with shock mount . In my case, shock slide on the both side with standard RockShox mounts and Monarch Plus RC3. I added some rubber and I am going to buy shims. This is from my response that I recently posted in the "Riot - Shock Tuning for CBF" thread. 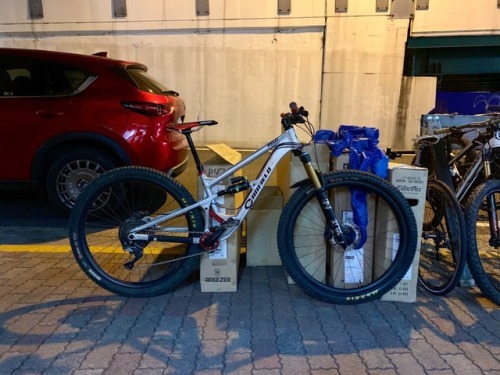 "I measured the frame's front end shock mount with digital calipers and got 22.21mm, and the frame's rear I got 35.22mm. I was sent an incorrect 22.0mm kit for the front (measured 21.95mm), and a correct 35.2mm kit for the rear (measured 35.15mm). 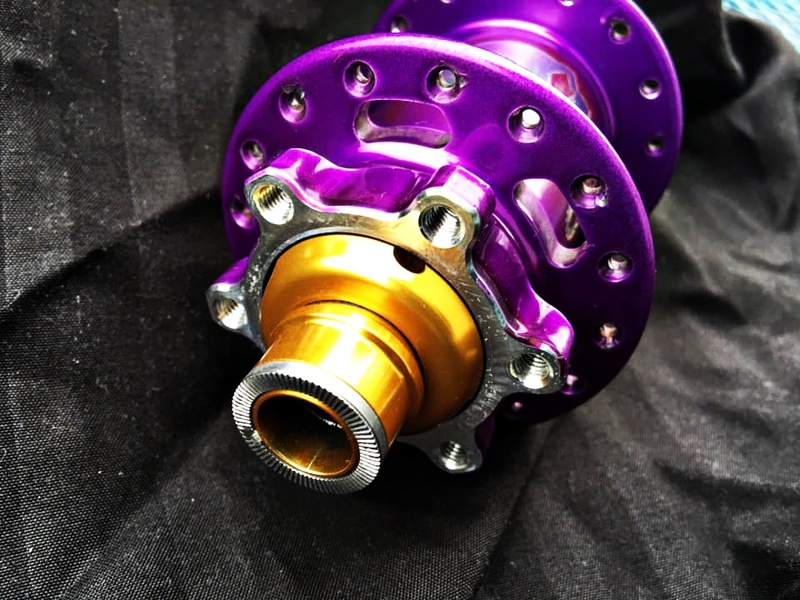 So, I just ordered the correct size 22.2mm front mount kit from Worldwide Cyclery, and now I can sleep better at night again. I received the 22.2mm kit and measured the axle at 22.17mm. It fit perfectly, as opposed to the original 22.0mm kit where I could see the front shock mounts flex inward a bit as I torqued down on the mounting bolt. I didn't record what the width of the spacers were for the 22.2mm kit, but only remember that they were the same width for the pair, and they were both slightly wider than the spacers from the 22.0mm kit. I did not measure the width of the installed IGUS bushing in the shock eyelet either. Last edited by A. Rider; 03-13-2019 at 09:47 AM. Thanks a bunch for the recommendation, it sounds like exactly what I need. I'm positive that the width is 22.2mm, I measured it with a set of digital calipers. Strangely enough, the lower shock mount for me came out to 35.55mm, not the 36mm that Canfield lists. Thanks for the info, it sounds like the 22.2 Fox hardware works great as well. From now on I'll be sticking to either Fox hardware or the stuff out of Offsetbushings. 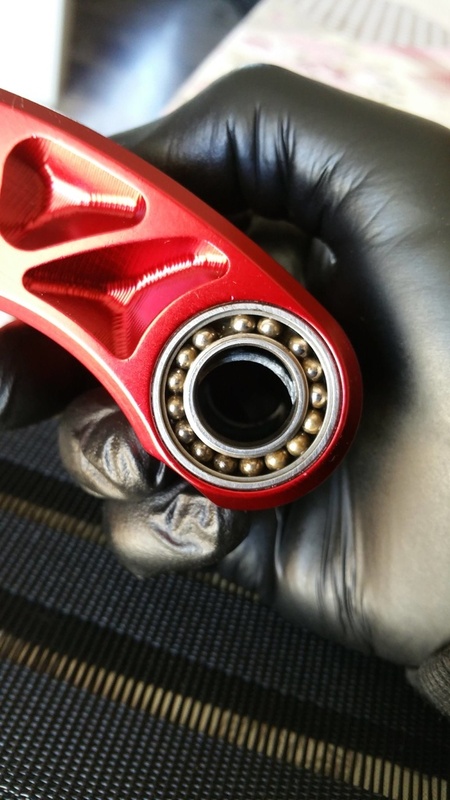 It looks like OffsetBushings is still using aluminum spacers too, like they did when I ordered actual "offset" bushings from them like 4 years ago for another bike. 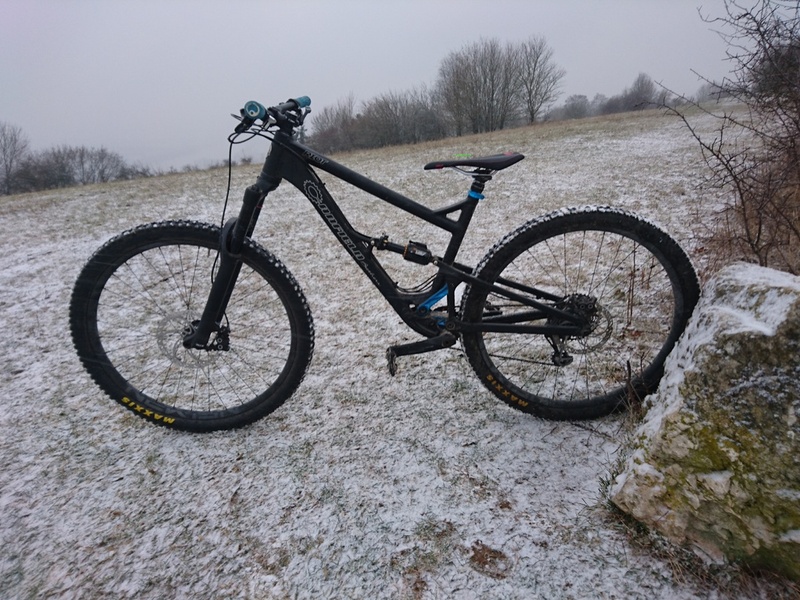 I currently have not experienced the side-to-side/horizontal play at the front-end of my DVO Topaz though (even with the incorrect 22.0mm upper/front-end assembly I replaced), but my Riot is new ​new and I've only ridden it properly only 3 times (because it's now/still snow-covered here). 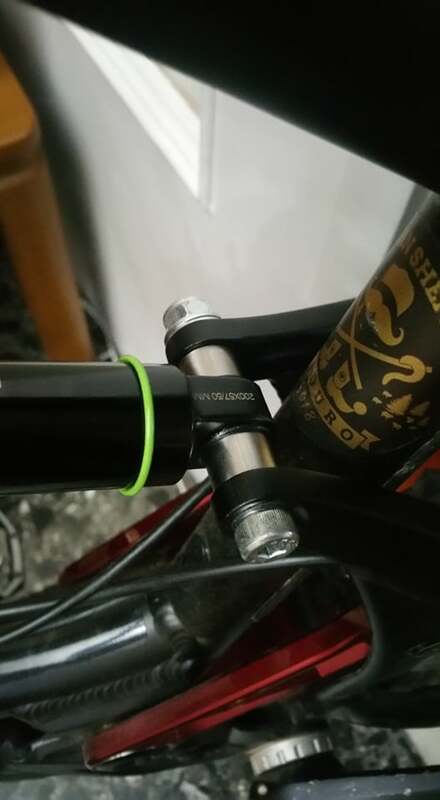 Also, I bet the subtle variability in the lower shock mount of the frame's rear triangle doesn't really matter because the whole assembly is just a bit springy there when not bolted together (my opinion, which stinks just as much as yours :P). Last edited by A. Rider; 03-14-2019 at 03:25 AM. I have a lot of bad words only. Why they wrote one spec, but frame mount has other. I will check my frame on weekend. Curious, what does the nut and bolt do that the original bolt and frame threads can't achieve? I hope they still make aluminum frames. Wonder why they haven’t. Would love to have a Jedi! Interesting...3 full years of riding hard in all conditions and my bearings are pretty good still. May replace a couple soon. When you have one user that constantly seems to be an outlier with issue you have to start to wonder if its the product or the user. I can't say that anymore. I went for just one 3 hour ride with the correct size 22.2mm shock mount kit, and looked late in the ride to see how it was doing. There is a bit of that side-to-side play at the upper assembly happening for me now as well. I didn't see that with the undersized 22.0mm kit, so the problem is that the spacers supplied in the 22.2mm kit are too narrow! I'll probably order a standard kit from OffsetBushings later on. Last edited by A. Rider; 03-17-2019 at 07:31 PM. It seems like DVO's spacers are straight up undersized. If you do pull the hardware, it would be great if you could measure the spacers. My 22.2 hardware spacers were 2.7mm. I dropped by a local DVO dealer and they recommended just cutting some small shims from a can to prevent the movement. I'll start with that, and later on get some offsetbushing hardware. Disappointing that the OEM shock on the Riot doesn't have well fitting OEM hardware. here skf is good but is for wheels not open links for MTB in my wheels works veyr good 2 years now! My stock bearings had to be replaced this month, after just under a year. However the bearings themselves were still alright, but the wishbone developed play and Seans recommendation was to replace them. I rebuilt my linkage and repacked grease in the old ones probably twice over the last year. I swapped for fancy shmancy black oxide blah blah enduro max's and they're much better. Hoping they survive the CO dust and remaining winter muck longer than the last ones did. My frame was a NOS 2017 bought around April/May of last year and had the standard Enduro blue bearings in them. No complaints about them really other than the odd play but I attribute that more towards manufacturing tolerances in the suspension layout. Wish shims had been the response from CB! 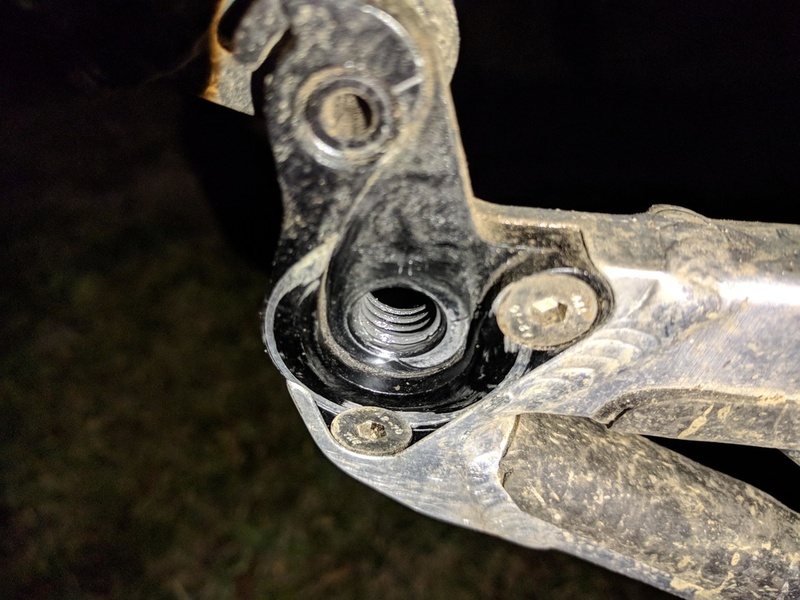 I'd much rather curse for an extra hour trying to get a second set of shims in place on the wishbone than have to drop $$$ for new bearings anytime some side to side wobble shows up. Had a similar issue with the bottom link having play inside the front triangle. In my mind it was a tolerancing issue. 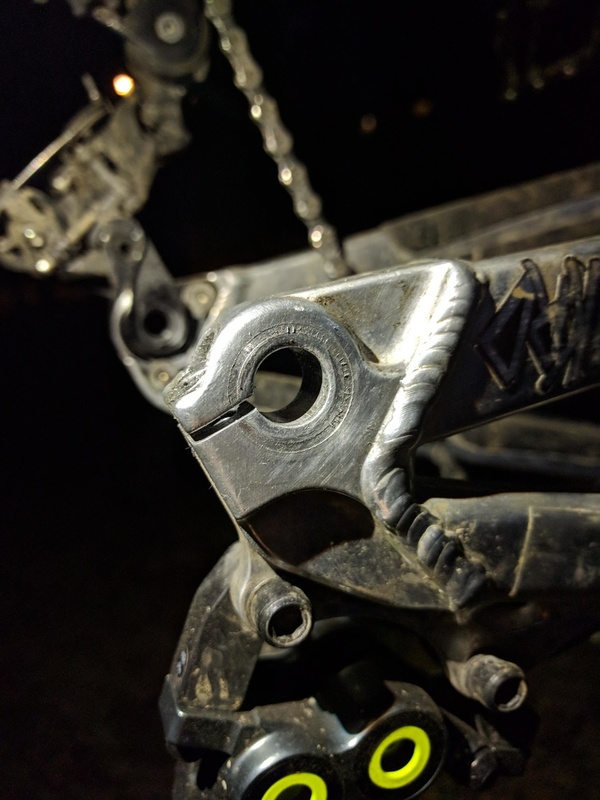 I placed a thin .02" shim in between the outside of the frame and the pivot bolt head. 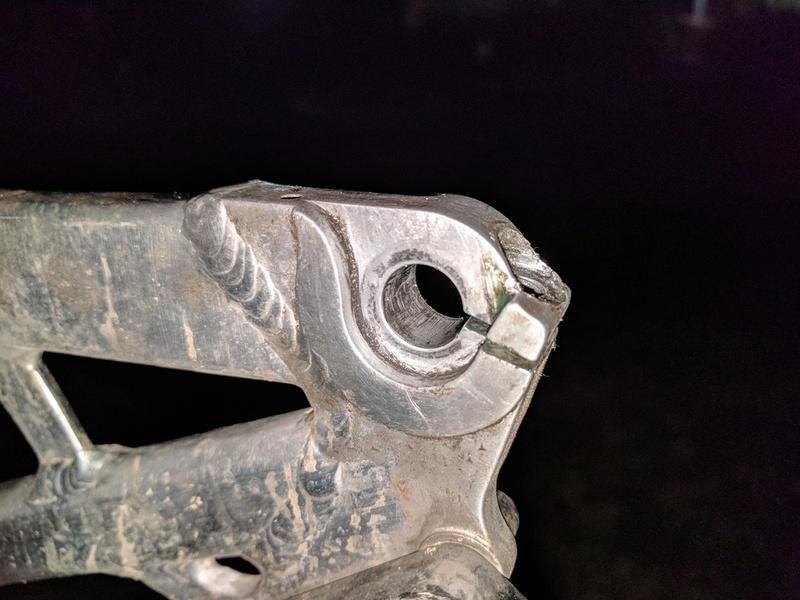 This effectively shortened the shoulder length of the bolt and allowed for a bit of compression of the frame to take up the slop. This was only detectable with the bike taken apart under careful inspection of the front triangle and bottom link together. I should also note, that I only noticed this when I swapped my 2016 Large frame for a 2017 XL frame. The XL had a slight counterbore on the outside of the frame that allowed the pivot bolt to sit deeper, effectively lengthening the shoulder and forcing the bolt to bottom out before the play could be compressed out. The shim I added really just filled the counterbore depth and everything was happy after that. 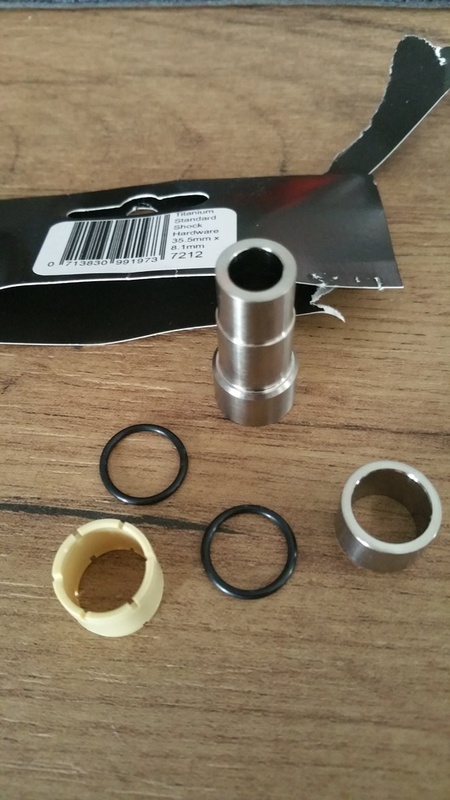 For anyone dealing with hardware problems, I would recommend just getting a kit from a manufacturer that machines their own hardware like offsetbushings.com. 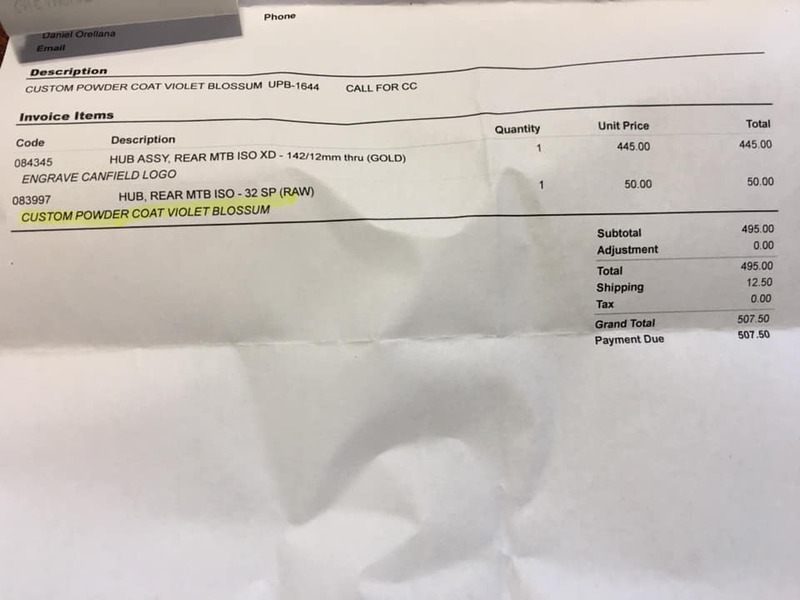 I purchased a kit from them in 22.2mm for my upper mount. After getting it installed all movement and creaking in the mount is gone. Measured with my rather cheap caliper, the kit's tolerances seem to be acceptable. The pin measured about 22.3mm, and the spacers 4.8mm. The construction is a fair bit nicer than the stuff out of Fox/DVO and RS as well. The only minor annoyance is that there doesn't seem to be any seals on the hardware kit, just two aluminum reducers and a brass pin. I'll have to see how this holds up long term in wet and muddy conditions. For now, my Riot is back to being (relatively) quiet. A bit off topic, but does anyone have experience setting the Topaz's rebound on the Riot? I weigh 180lb geared and have been having difficulty getting the rebound just right. I'm switching between 5 to 6 clicks from full slow. I can't quite tell if the feeling I'm getting is from the shock packing up, or from too much rebound. I would appreciate any insights into getting the rebound dialed in. Id start with rebound all the way in and session a trail. Back off on click and repeat until it feels right. If it never does. Its probably too much high speed compression. Or shock is messed up. I ride really rocky trails and run a lot of rebound. Thanks for the recommendation, I'll give that a shot. I would recommend just getting hardware from somewhere like offsetbushings.com. Their hardware isn't much more than Fox's stuff and is a good bit nicer quality, being machined out of aluminum and brass. The 22.2mm set I ordered from them took up all the slop in the upper mount that was present with DVO hardware. Thanks I will order it but I want and rear one and they have only 35x8 in site! Since they machine their hardware in house, I'm sure they would be able to make whatever size you need. Just a heads up, when I measured the rear shock mount on my riot it did not come out to 36mm (it was around 35.5ish mm). If you're going to bother doing a custom set of hardware, I would recommend measuring your riot and getting the exact width of your mount. Sound good, I would think that offsetbushings.com would be able to make what you need. Did a problem come up with the Burgtec hardware? It looks like pretty good stuff, with o-rings and a titanium pin. This may have been brought up previously, but with all the hardware talk it came across my brain again: has anyone used true offset bushings to adjust geo? The idea of slacking out the HTA by a degree is tempting. I rarely have pedal strikes so not really worries about the BB drop. I though about going down that path with the new hardware, but felt the compromises outweigh the benefits for me (slacker STA, possible kinematics changes). While definitely more expensive than offset hardware, I think the best way to slack out a bike is with an angleset headset. 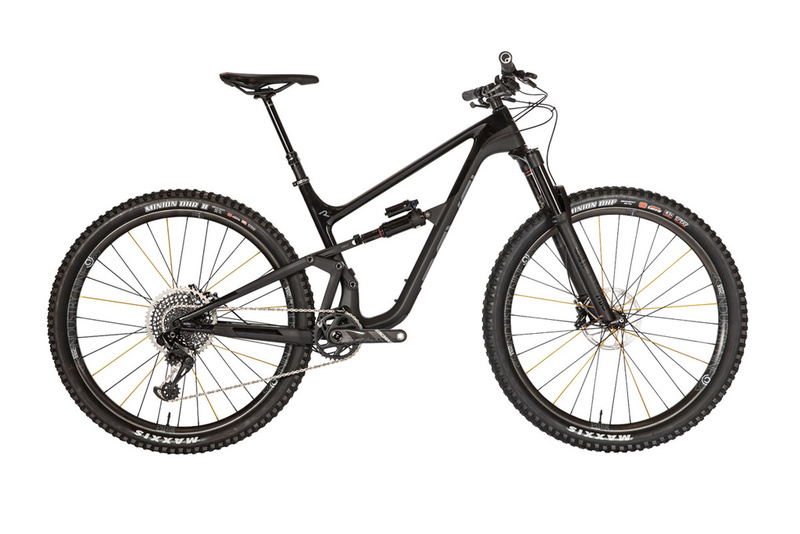 You not only get a slacker head angle, but a steeper STA and slightly more reach, without messing with the suspension. 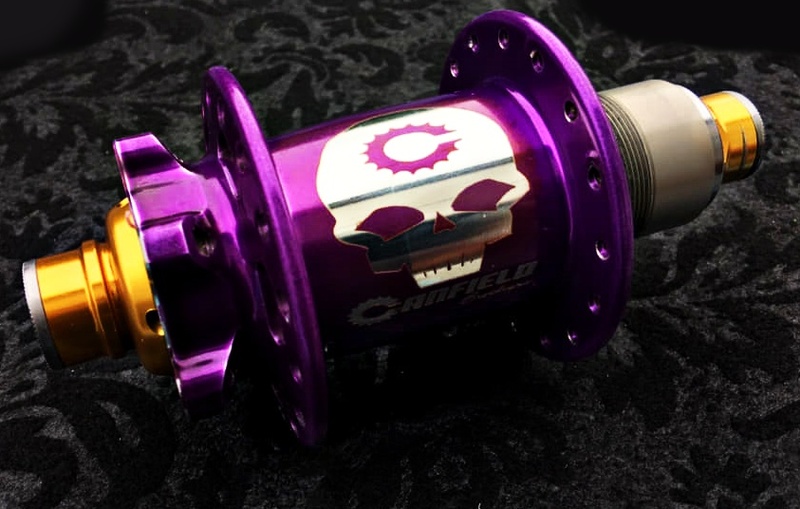 Superstar Components has got a pretty good price on their UK made ones - I'm thinking about maybe trying one down the line. Slacken head angle 2 degrees, using Works Components. Hopefully the top tube does not crack on you. Oh... I’m not so heavy or can’t do big jump, I believe it’s gonna be ok. I am currently using the offsetbushings.com bushings and I have to say I am impressed. The bike corners way better. It definitely makes you feel a little more in the bike. I can’t say I’ve noticed any discernible difference with the seat angle slacker. It climbs very well. The biggest downside is at full compression the biggest tire that will fit is a 2.3. Otherwise, lower & slacker has made the bike more fun in the turns and a little more confident in rock gardens. I’d say go for it, I also talked to Sean about it and he didn’t seem to think it would be a problem. I have a -1 degree works angle headset and a 150mm Fox 36 on mine. Should be around 64.8 degrees HTA and 75.4 degree STA on an old medium frame (according to geo calc). It certainly changes the characteristics of the bike. It climbs better (changed from 40mm to 50mm stem as well), it is way more stable and gives more confidence going down. A little less playful, but all in all a great geo change. I also put a Smashpot upgrade in the fork and the traction is amazing! Do you use a pair of them? and if you can upload any photos? what sizes you are using from offsetbushings? Sorry for the confusion. I did not put offset bushings on my bike. 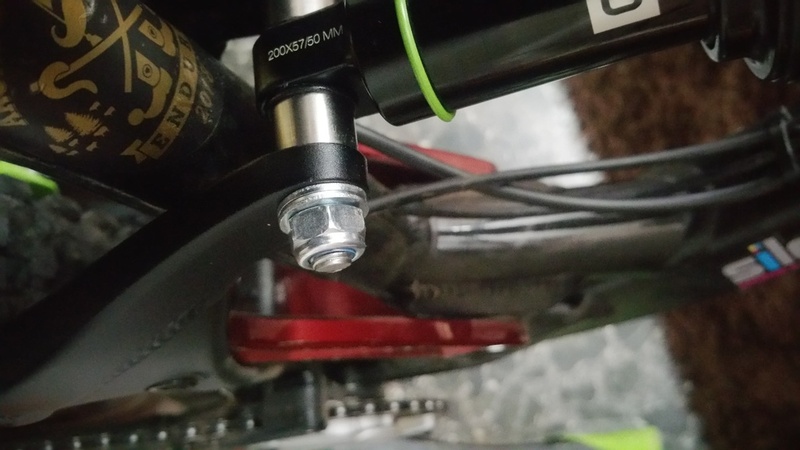 The geo changes comes from the angle headset and the longer fork. I have considered offset bushings, but have been reluctant because I think it may reduce the tyre clearance and mess with the CBF performance. 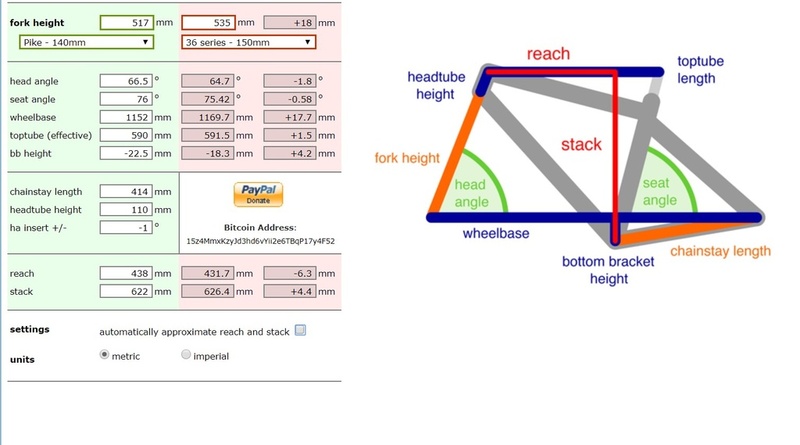 The reach is reduced, that's why I increased the stem length to 50mm. BB is also sligthly higher because of the higher fork. Offset bushing would lower it..
Last edited by Ameiza; 21 Hours Ago at 01:46 PM. I ended up mixing the spacers from my newly-acquired 22.2mm DVO hardware kit with the axle from my original 22.0mm DVO hardware kit. For the 22.2 kit, my digital calipers measured both spacers as 2.75mm, and the axle as 22.17mm. For the 22.0 kit, both spacers were 2.65mm, and the axle was 21.95mm. The shock front eyelet with IGUS bushings measured 16.24mm wide. I combined the 21.95mm axle with the two 2.75mm spacers. This left a gap of 0.21mm total remaining for wiggle room for the pair of rubber O-rings (so about 0.1mm for each O-ring). 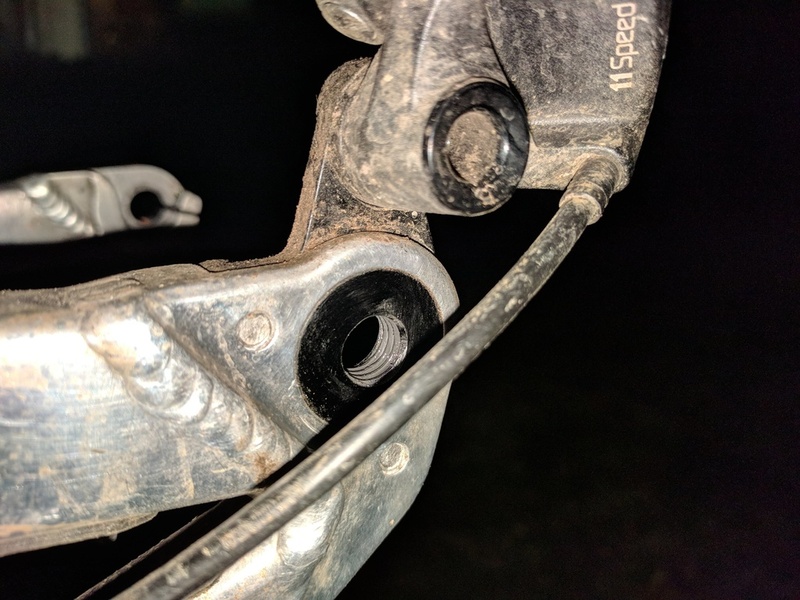 After snugging down the mounting bolt I could not visually see any side-to-side movement anymore at the front shock mount, but could ever-so-slightly perceive a bit of play. I consider this acceptable, and perhaps necessary else I assume there would be binding there instead?